When it comes to buying jewelry, many people know that choosing pre-owned jewelry is an simple way to keep more money in your wallet. However, there are plenty of other great reasons why buying pre-owned jewelry is something that can be considered. In this blog, we are going to go over some reasons you should consider buying pre-owned jewelry. Of course, buying pre-owned jewelry will save you more money than buying new jewelry would. This is because a pre-owned item’s price is discounted from the original time of purchase. In fact, most pre-owned pieces of jewelry can be up to 20 to 40 percent less than an identical or similar piece of jewelry. And, when you buy pre-owned jewelry from a reliable source, you can rest assured the item has been accurately valued, and that you are paying exactly what the piece is worth — no more, no less. Most jewelry is designed to last, even if it is used. If a piece of jewelry is well cared for and maintained, then it could remain in excellent condition for decades to come. Essentially, this means that even though a piece is pre-owned, it could look brand new and costs far less than compared to the new items being sold at jewelry stores. Furthermore, many jewelry items are designed with a classic style that remains in fashion just as long — if not longer — as the piece remains wearable. Of course, getting something new is great, but second-hand jewelry can be just as beneficial. There is something sentimental about receiving both a brand new and a previously owned piece of jewelry as a gift. And most people, including your family and friends, will not be able to tell the difference between new and previously owned jewelry. As long as your pre-owned jewelry comes with an assurance of structural integrity and craftsmanship, it can be just as good as a new piece of jewelry. It takes resources to mine for gems and to manufacture the pieces you will see at a high-end jeweler. During the manufacturing process, finite resources are used and toxic gases are emitted into the air. There is less of a demand to produce new jewelry when buyers are more interested in purchasing pre-owned pieces. Buying pre-owned jewelry means less mining and pollution, and it saves valuable resources used during the process, like fuel, water, and forests. One of the most unique benefits of buying pre-owned jewelry is that you get to own a part of history. This is something you cannot experience when you buy a brand new piece of jewelry. Oftentimes, many used jewelry pieces are handcrafted using knowledge and techniques that are not really seen as much anymore these days. Each piece of pre-owned jewelry comes with its own story and history. Who knows, maybe a famous actress or public figure once wore the piece of jewelry you are interested in. The possibilities of purchasing any previously owned jewelry are endless, making it part of the fun! Another benefit to buying previously owned jewelry is the selection of pieces that you can choose from. With pre-owned, you are not limited to the collections offered in a jewelry store — you have the opportunity to choose between pieces from all collections, such as limited and exclusive or vintage and brand new. The options are seemingly endless! Another benefit to consider is that buying pre-owned jewelry can help you develop your own personal style. Each jewelry era has its own unique characteristics and styles of pieces. You can easily make a statement by wearing jewelry from your favorite era or time! Additionally, you can also find pieces of jewelry that likely nobody around will have! Not only do these pieces make a statement on their own, but they are conversation starters and can help complement your unique sense of style! As you can see, there are plenty of reasons to purchase previously owned jewelry instead of new, from saving money and being environmentally conscious to having a wide selection to choose from and better developing your style. When it comes to buying pre-owned jewelry, it is important to find a reputable seller so you know that you are getting your money’s worth. If you are looking for a reputable place to buy pre-owned jewelry, check out The Gold and Silver Exchange! All of the used jewelry we sell, whether its a used engagement ring, necklace, or another piece, is carefully inspected to ensure quality and value. 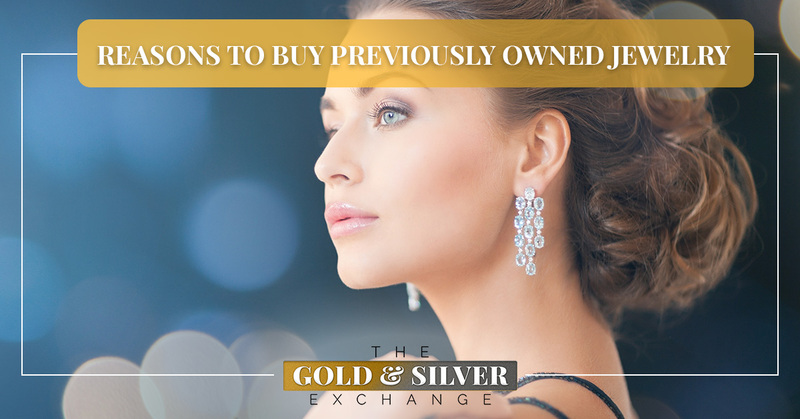 When you buy jewelry at the Gold and Silver Exchange, you can ensure you are getting the best deal around. Visit our jewelry stores in Grand Rapids and Greenville to find affordable jewelry pieces!